I have just spent a third afternoon taking photographs down at Marsh Mills which is a great place to stay as its the main route into Plymouth and the footbridge gives a decent view of all traffic. With the nearby Sainsburys store being useful for toilet breaks etc! During the past three days I have taken over 1000 photos which I now need to go through and sort out the best ones to upload to Flickr. One big suprise for me today was this elderly Olympian which has come up from Cornwall I belive. 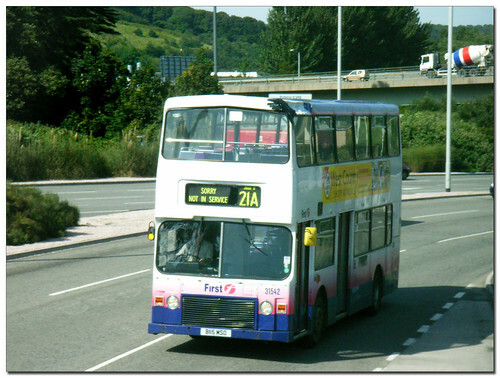 B115MSO is one of several ex Aberdeen Olympians based down in Cornwall. You might notice the large dents in the top right. Not sure what its doing up this way, but I am fairly sure it wont see service up here!